The opening bars of “Trippin’ on Your Love,” the first of two collaborations with the American group Haim, suggest that Bobby Gillespie’s latest opus is a nostalgia nod to 1991’s Screamadelica. It’s an appropriate gesture, considering that 25 years ago, Primal Scream had released two underwhelming albums and were relatively unknown outside of England. Gillespie was more famous for his stint as The Jesus and Mary Chain’s drummer. That all changed when the single “Loaded” propelled the band into the spotlight and found them sharing the stage with Depeche Mode on a highly successful American tour. 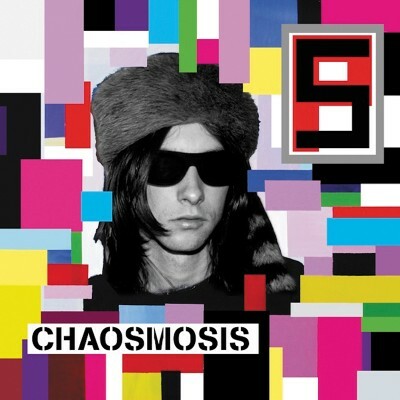 Genre-hopping is nothing new for Primal Scream. Gillespie and a revolving assortment of collaborators have explored a variety of avenues with a surprising amount of success. From the retro-rock of Give Out But Don’t Give Up to the electronic shoegaze wash of Vanishing Point and the harsh electronic releases XTRMNTR and Evil Heat, the band have been fearless in their experimentation. Certainly, the rock-orientated Riot City Blues and Beautiful Future releases felt less inspired and a bit too traditional. Still, a blistering festival set somewhere in the hazy outlands of Scotland proved to me that there was still fire in Gillespie’s belly. Nonetheless, it was during this period where the band fell off my radar, and as a result, I missed their 10th record, 2013’s well-received More Light, altogether. I’m officially back in the fan club, as Chaosmosis is a pop record that defies categorization. It finds the group revisiting the many facets of their varied past with a fantastic collection of songs that never feel like an act of desperation. Gillespie hasn’t run out of ideas—he’s simply revisiting places that haven’t been fully explored. Electronics are omnipresent, but there’s a nice balance between the guitar-driven tracks and the synth-heavy arrangements. Noise merchants will be somewhat disappointed, as the only venomous track is the brief “When the Blackout Meets the Fallout,” a distorted wail that acts as a mid-album tantrum before spinning off into the lighthearted “Carnival of Fools.” It’s the one transition between styles that feels off-balance. Even the stripped-back “Private Wars,” a ballad duet with Rachel Zeffira, feels more at home crammed between the aforementioned “100% or Nothing” and the wonderful lead single, “Where the Light Gets In,” featuring singer/actress Sky Ferreira.